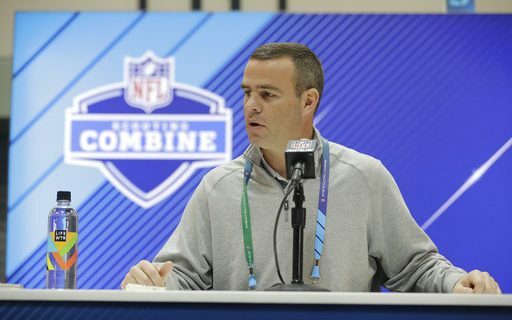 Bills GM Brandon Beane and Head Coach Sean McDermott held media briefings on Wednesday at the Scouting Combine in Indianapolis. It was their first public comments since the end of the season. With a number of issues flying around in anticipation of free agency and the draft, Bills fans were hoping for some solid answers to those questions. Forget it. What they got was the standard, non-committal, talk without saying anything answers from both men. That’s how it works in the NFL. The Bills decisions makers have a good idea how they’re moving forward. But it does not benefit them to let the rest of the league know, even if the fans demand answers. So to help you out, I’ve picked a few of the major questions that were asked at both men’s news conferences and run it through my very own truth meter to try and find out what they really meant. What They Meant: Key in all of this is “right now” and “at this point.” Even if the Bills are going to get rid of Taylor (which I believe they will), they aren’t going to do it now or say they will. Keeping him around lets them examine the trade market. Even paying the roster bonus does the same thing. Plus, until his replacement is on the roster, they don’t need to do anything. Nothing that either man said tells me that anything has changed. Taylor is gone. They just don’t know who exactly his replacement will be. Question: Will Kyle Williams Return? What They Meant: Williams is a free agent. Does he want to come back? Or does he want to retire? Will it depend on the contract offer? These comments tell me that the Bills want him back. But at the right price. That may not be Kyle’s price. It sounds like Williams hasn’t given the Bills an idea if he wants to come back. The longer he doesn’t is telling. I also sense the Bills will only wait so long and pay him so much. Question: Was Vontae Davis Signed to Replace E.J. Gaines? What He Meant: Gaines is asking for more than the Bills are willing to pay. That’s why they signed Davis, as the replacement. Could Gaines come back? Sure, but at a lot less than what his asking for. If not, the Bills have moved on. Question: Is Nathan Peterman in the Mix at Quarterback? What He Meant: Yes. He is in the mix. McDermott would not have drafted him, and started him against the Chargers, if he didn’t like what Peterman does and how he plays. The DNA comment is telling to me. He’s McDermott’s kind of guy. Now, is that as a possible starter? Or a bridge starter to a drafted rookie? Or a backup to a veteran? We’ll find out. But it will be one of those. Like it or not, Peterman will be on the roster in 2018. Greg Gabriel has some ideas of who the Bills should be looking at during the Combine.